Strawberry Cinnamon Breakfast Buns are the perfect baked good for Mother’s Day! This dairy-free adaptation of a classic cinnamon roll takes on seasonal flavors with the addition of fresh strawberries. This treat is drizzled with a strawberry glaze as a final touch. Serve these buns up with a mimosa, and brunch is served! I don’t like to say my opinion is the be-all-end-all… because I know that’s not true. We were all made differently for a reason, and that’s something to be celebrated! After all, we don’t all have the same personalities, looks, tastebuds, etc., and life would be really boring if we all liked/hated the same things. Also because I know someone out there in the Internet land will be sure to list all the reasons I’m wrong. However, today is one of those instances where I feel like I know what’s up. Maybe it’s because I’m a mom. Maybe it’s because I’ve eaten these breakfast buns for the last two mornings and absolutely cannot get enough of them. Whatever the case, I’m gonna go there. I’m gonna make a blanket statement. And I’ll be damned if it’s not (mostly) true. Here goes: You know what moms (and most people) like? I can definitively tell y’all that brunch is my jam. I honestly wished we brunched more. And I look forward to future brunches because breakfast foods — sweet and savory — are so darn tasty. And if somebody *cough, cough* made me these Strawberry Cinnamon Breakfast Buns for Mother’s Day, I would be over the moon. These buns are definitely a labor of love, but when you make them, consider your mom labored — probably a lot harder than you’re laboring on these baked goods, mind you — to bring you into the world. So. Perspective. And maybe a wee bit of inspiration? Whatever the case, I recommend baking these buns for your mama (or any special lady in your life who you think needs a treat!) if she happens to be a sweet breakfast fan and a strawberry lover. If she’s anything like me, she’ll love them! Strawberry Cinnamon Breakfast Buns are the perfect baked good for Mother's Day! This dairy-free adaptation of a classic cinnamon roll takes on seasonal flavors with the addition of fresh strawberries. This treat is drizzled with a strawberry glaze as a final touch. Serve these buns up with a mimosa, and brunch is served! Measure the milk and coconut oil in a glass measuring cup. Microwave until the oil has melted. Pour the warm milk/oil mixture into the bowl of stand mixer fitted with paddle attachment. Add 1 cup of the flour, as well as the vanilla extract, vanilla bean caviar, sugar, egg, yeast and salt. Beat on low for around 3 minutes, stopping occasionally to scrape the sides of bowl. Add the rest of the flour to the dough. Mix on low until the dough comes together and feels tacky. If dough is extremely sticky, add flour by the tablespoon until the dough comes together and pulls away from sides of bowl. When it is of the right consistency, turn the dough onto a lightly floured work surface. Knead until the dough is smooth and elastic, adding more flour if sticky. (This should take around 8-10 minutes.) Form into ball. Spray a large glass bowl with nonstick spray, and transfer the dough into the bowl. Cover the bowl with plastic wrap, then a kitchen towel, and move to a warm place in your house. Once the dough has doubled in size, punch it down in the bowl, then transfer onto a floured work surface. Roll the dough into a rectangular shape that is about ½" thick rectangle. Spread the filling mixture evenly on top of the dough, leaving a ½" border. Sprinkle the chopped strawberries on top of the filling evenly. Starting on a long side, roll the dough into a log, pinching gently to keep it rolled. Be gentle with the dough, and keep in mind that this part can get messy. (You've been warned! But it's totally worth it.) Pinch the seal closed gently. With the seam side down, cut the dough crosswise with a sharp knife into 18 slices. I've found that making a cut in the middle, then making cuts in the middle of those (and so on and so forth) is the easiest way to get evenly-cut rolls. When the oven has preheated, place the baking dishes in the oven. Bake for 25-30 minutes, or until the tops are golden, then remove from the oven. Invert the rolls onto a plate (so the sticky topping is front and center! ), and let cool for 10 minutes. While the rolls are cooling, make the Strawberry Icing. In a blender, mix the strawberries and powdered sugar together until smooth. When rolls have cooled slightly, serve individually, and drizzle the icing on top of the rolls. Enjoy! Note that the prep time includes rising time and rest time. If you make these the night before, put them in the refrigerator in the baking dishes BEFORE the second rise. The morning of, be sure to pull them out of the fridge in time to do their second rise. This will take a little longer, as they'll be cold, so allot about an hour and a half for them to sit out and rise, then bake as directed. A little behind-the-scenes from this shoot, which took place yesterday morning. We’re always keeping it exciting around here, as evidenced by this image. Yes, that’s my daughter walking around with a remote. Yes, that’s me standing partially on a chair and partially on a table. And yes, I’m shooting on my super messy desk. This is how we roll, y’all! And now, who’s ready for some MORE brunch recipes to inspire your Mother’s Day morning… or just for a fancy weekend breakfast, in general?! 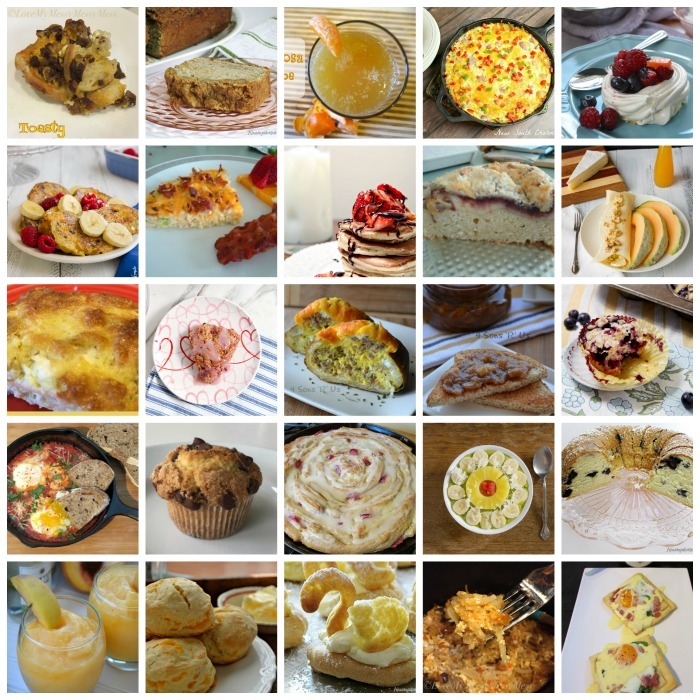 Some of my bloggy friends and I have come together to bring you a fantastic list of brunch recipes! What do you plan to do for Mother’s Day? Strawberries are my favorite and this recipe looks delicious! I can’t wait to try it! Strawberries are my favorite, too, Ellen! Thanks so much! I hope you enjoy this recipe as much as I have! Oh. My. Yes please, I’ll take a pan. These look amazing! I love the behind the scene photo too! I’ll just send one over. 😉 Thanks so much, Carlee! Im DROOLING over these perfect cinnamon buns! I LOVE the addition of the strawberries for a summery twist! Thank you, Bethany! We’re HUGE strawberry fans over here, so adding them to these cinnamon buns was a delicious move. I hope you enjoy them! Thanks so much, sweet friend! Behind-the-scenes snaps always make me happyn. 🙂 I’m glad I’m not the only one who stands on chairs and tables to get the shot. 😉 I hope that you had the chance to make y’all’s moms brunch! These look so sweet! Perfect for any morning! Thank you, Erren! These are definitely GREAT for any morning! Oh boy these look super awesome. I wish I had a big batch to have for a while. I need to make some soon. Yours look terrific. Thank you so much! The beautiful thing about these buns is the batches last for a while, even though they take a long time to put together. They’re definitely worth the trouble, though, and I hope you and yours enjoy them! I hope you get feeling better soon. Your recipe looks great! Breakfast buns…yes please! I’m always up for brunch, and these look amazing! Mmmmm…that glaze looks amazing! I can’t wait to make these! Now THIS is my idea of Cinnamon Breakfast Buns! Ugh, I’m so sorry about the sinus infection – I hope you feel better soon. And yes to brunch, particularly if it involves these buns! Thank you so much. Here’s to brunch and these buns!